I have just uploaded my latest free Access add-in: Cool MS Access Switchboard Builder for Microsoft© Access 97 and 2000/2002/2003. Cool MS Access Switchboard Builder uses the native Switchboard Items table created by the Access Switchboard Manager. Become the know-it-all of Windows Vista and Office 12 by attending this free half-day event to take a sneak peek at features still in the works. Application task panes, add-in development, and the new user interface. The Office OpenXML File Format, which allows for manipulation of files, creating files without using the individual programs, repurposing content, and merging files with business data. I thought I would share with you some truly useful tools that enhance productivity in MS Windows. All are freeware, except for Folder Pilot. A shell extension that adds a toolbar to Windows Explorer. This functionality will be available in Windows Vista, but you can get it now for Win2000/XP with Folder Pilot. It adds breadcrumb navigation, where your folder history in a session is dynamically loaded to the Folder Pilot toolbar. Also, a right-click menu allows you to quickly access recently viewed folders, or your own custom entries. 30 day trial. Buy for only US$20. From the makers of Folder Pilot. Adds a very useful Explorer pane in Windows Explorer, with up to 5 custom tabs. Supports full drag'n'drop and the Windows Explorer right-click popup menu. Free. PRO version allows up to 10 tabs and costs only US$15. Display all the shell extensions for file types on your PC, and allows an extension to be disabled. Right-click in any Windows Explorer window, and a popup allows you to select any files with the entered extension in the open folder. Extensions used are saved and available from a drop list, making it as easy as 2 clicks! Free - but you need to register with CodeProject.com to download. The Reports also have a crisp modern look. Though I don't think the ditching of the Switchboard Items table navigation paradigm is a good idea, as it complicates the management of application navigation. 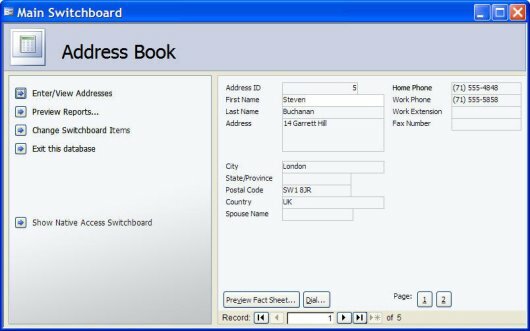 If you are looking for a modern-looking Access gui and navigation implemented using the native Access Switchboard Items table, then have a look at my sample Access Switchboard Applications at aadconsulting.com. Get hold of the free Visual Studio 2005 Express to get access to this cool new Help Authoring Tool. Microsoft and Innovasys Ltd., a leader in help authoring and documentation tools, today announced the inclusion of a tailored version of the Innovasys HelpStudio help authoring product, HelpStudio Lite, in the Microsoft Visual Studio 2005 SDK. By providing a full help authoring environment within the Visual Studio 2005 SDK, Innovasys is providing developers building components and products that integrate with Visual Studio 2005 a complete solution for authoring help materials to accompany their solutions. HelpStudio Lite enables developers to author and maintain high quality help content with a consistent style quickly and easily. 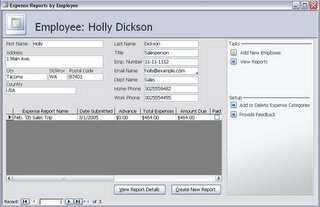 HelpStudio Lite includes a template based authoring concept that makes it easy for developers to customize and change over time the look and feel of a help system without requiring rework to existing content. HelpStudio Lite ships with two default templates; one that reflects the look and feel of Visual Studio .NET 2003 technical documentation and another implementing the new style introduced with Visual Studio 2005 technical documentation. "Enabling developers to concentrate on content authoring is a core part of the HelpStudio design. The template based authoring concept, together with the many other productivity features of HelpStudio Lite enable developers to get great looking results, consistent with the established Microsoft documentation styles, right out of the box." said Richard Sloggett, CTO of Innovasys. 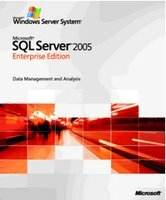 Download an updated version of the documentation and tutorials for Microsoft SQL Server 2005 (20 January 2006). Microsoft Office Open XML Formats Overview The new Office XML Formats introduce a number of benefits not only for developers and the solutions they build, but also for individual users and organizations of all sizes. Get a preview. Office 2003 Tool: WordprocessingML Transform Inference Tool The XSLT Inference tool helps you easily create XSL Transformations (XSLT) that quickly transform XML files into WordprocessingML with complex and rich formatting. Microsoft SQL Server 2005 Upgrade Advisor Download the January 2006 version of Microsoft SQL Server 2005 Upgrade Advisor. Upgrade Advisor analyzes instances of SQL Server 7.0 and SQL Server 2000 to help you prepare for upgrades to SQL Server 2005. Overview of Server Capabilities in Visual Studio 2005 Tools for Office This download contains a Visual Studio 2005 Tools for Office Benefits Registration solution written in Visual Basic and C# which uses Microsoft Office Word 2003 on the server. Visual Studio 2005 Tools for Office IntelliSense Code Snippets This download contains 71 IntelliSense code snippets for use with Visual Studio 2005 Tools for Office. An MSDN TV Broadcast: Visual Basic Futures - Latest Developments in the LINQ Project A discussion of the latest Customer Tech Preview of the next version of Visual Basic. Overview: Visual Basic 9.0 will offer radical improvements in its ability to work with data in all its forms: as objects, as XML, and as relational data. Paul Vick and Amanda Silver discuss the latest Customer Tech Preview of the next version of Visual Basic to hit the Web. It includes support for DLinq (language integrated query over relational data) and expanded editor support for query statements and integrated XML. NB: To read these compiled .chm files after downloading, UNBLOCK them before opening. Server 2005: Set the Stage for a Smooth Upgrade Get an overview of what you need to know when examining your current environment and developing an upgrade plan. Boost Performance with New Features in SQL Server 2005 Take an in-depth look at nine of the best new features and technologies that make SQL Server 2005 faster and more scalable. Your Metadata Metadata can unknowingly reveal secrets about your database. New tools and restrictions help to keep your data protected. Running the Microsoft SAP Infrastructure on SQL Server 2005 Many enterprises rely on SAP to handle mission-critical functions. Find out how Microsoft migrated its SAP environment to SQL Server 2005. Running SQL Server 2000 on a Windows Server 2003 Server failover cluster will get you more uptime by alleviating your reliance on a single server. Using the SQL Server 2000 T-SQL Syntax You can manipulate XML in a variety of ways. For example, you can access data contained in an XML string passed into a stored procedure and produce XML output. Find out what these flexible, powerful XML features can do for you. Get A Traffic Report: Analyze Your Database Usage With System Tables By querying data from the master.sysprocesses table you can get almost any information you need about connections to your SQL database, what each process is doing, which processes are blocking, and lots more. Then you can use this data to create some truly enlightening reports. Async Lifestyle: Manage Your Tasks With Service Broker SQL Server 2005 Service Broker is more than just a developer tool. DBAs can use it to schedule tasks, run batch processing, and perform routine database maintenance. On The Horizon: Improved Data Security In SQL Server 2005 Microsoft has performed extensive threat modeling and security analysis to identify the threats facing database servers. This work has resulted in an upcoming version of SQL Server, SQL Server 2005, that is secure by design. This article enumerates the various security improvements to the popular database. Microsoft Office Office Gone Wild? You May Not Have Lost That File After All Don't panic. That file may not be gone. Before you give up hope, try one of these tips and you just might be able to recover that lost or damaged Microsoft Office file. Be Prepared: A Guide to SharePoint Disaster Prevention and Recovery s SharePoint becomes an integral tool for collaborating and sharing information, it's increasingly important to know how to recover from a failure. Get Better Metrics with New Reporting Tools for SharePoint Portal Server Using the new reporting tools, you can examine content and analyze how visitors using your sites so you can optimize your portal to better serve its users. Create an Outlook Add-in that Consolidates Disparate Task Data into a Single View Learn how to consolidate task data residing in various Office file types into an Microsoft Outlook add-in, and incorporate snippets of data included in Microsoft Office files into a meaningful solution. Use Visual Studio 2005 Tools for Office to create a managed add-in for Outlook 2003. Create associations between contacts and Inbox items and report on Inbox activity in the context of a user’s contacts list. SQL Server 2005 System View Map The SQL Server 2005 System View Map shows the key system views included in SQL Server 2005 and the relationships between them. Assess your skills for the Office 2003 in areas such as document sharing, data analysis, communication, graphics, and media, and get your Office System learning plan. Visual Studio 2005 Tools for Office Sample: Using Dynamic Controls and Worksheets This download contains a sample Sales Lead Tracking Microsoft Office Excel 2003 solution built using Microsoft Visual Studio 2005 Tools for the Microsoft Office System. Visual Studio 2005 Tools for Office Sample: Redesigning an Excel VBA Solution for .NET Using Visual Studio 2005 Tools for Office This download contains two versions of an IIS Log Analyzer tool: a VBA version and a Visual Studio 2005 Tools for Office version. Visual Studio 2005 Tools for Office Sample: Migrating a Word VBA Solution to Visual Basic Using Visual Studio 2005 Tools for Office VBA Migration Case Study based on Microsoft Word 2003. It is intended for experienced Office/Visual Basic for Applications developers who are taking their first steps with Visual Studio 2005 Tools for Office. Visual Studio 2005 Tools for Office Sample: Using Excel 2003 to Manage Project Sites with Windows SharePoint Services 2003 Learn how to leverage Microsoft Office Excel 2003 and Microsoft Visual Studio 2005 Tools for the Microsoft Office System to create and manage Microsoft Windows SharePoint Services Web sites. Visual Studio 2005 Tools for Office Sample: Creating a Capital Expenditure Model with Visual Studio 2005 Tools for Office and Excel 2003 Using Visual Basic and C# Learn how to use Microsoft Visual Studio 2005 Tools for the Microsoft Office System to turn a Microsoft Office Excel 2003 spreadsheet into a complex capital budgeting application. Visual Studio 2005 Tools for Office Sample: Migrating a VBA Excel Application to Visual Studio 2005 Tools for Office This download contains two versions of an IIS Log Analyzer tool: a VBA version and a Visual Studio 2005 Tools for Office version.